The network of scenic canals is a quintessential part of Amsterdam, called also Venice of the north. 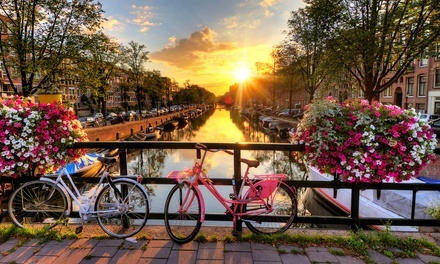 Holidaymakers are invited to take a relaxing sojourn along the city’s most secluded waterways passing under small bridges and by the pavement cafes and bicycle-lined streets. The multilingual audio guide will provide commentary while the passengers discover the iconic landmarks of the city including the Old Port, Anne Frank’s House, the Magere Brug bridge, and the Westerkerk church. Valid from 15 Nov 2018 until 31 Dec 2019. Price for 1 adult, 1 adult and 1 child, 1 adult and 2 children, 2 adults, 2 adults with 1 child or 2 adults with 2 children, depending on option chosen. Must book within 5 days from voucher purchase. Booking required by online form: https://docs.google.com/forms/d/1SiSvIJ2LJAgNahO803Bq6Hi1h-zOAgp1XDF0v6NnItc/viewform?edit_requested=true, and subject to availability. Please provide your voucher number and ID number and double check the booking details 5 days prior to the tour. Limit of 3 vouchers per person. 1. After purchasing the coupon, you must fill-out the Groupon coupon by completing the form a maximum of 5 days after the purchase date. Please note that only the Explorer Pass sent to you by Ceetiz will be accepted on site. Groupon voucher will not be accepted. When making the booking, you will be asked to indicate a provisional date for your trip, but you will be able to use your voucher on the date of your choice for 6 months from the date on your voucher. To take part in this activity, simply present your booking voucher at the address indicated on your voucher, in order to go on the cruise. Departure times: approximately every 20 minutes between 9am-10pm in summer and every hour between 10.10am-6.15pm in winter. Please note that during the Amsterdam Light Festival, from late November to mid-January, the last cruise departs at 4pm. Children under 5 years old: free of charge. Children are considered as such between 5 to 12 years old.